Aloha, we'd like to share with you the story of our property, Pu'u Menehune, which was, until recently, bull pasture for Parker Ranch. Our pristine 13-acre parcel, located in the heart of Paniola (Hawaiian cowboy) country, is blessed with a meandering stream, abundant waterfalls, and unsurpassed views of sacred Mauna Kea ('White Mountain') volcano. As you will experience when you hike Pu'u Menehune, this area was the summer playground for Hawaiian Ali'i (royalty) who came to Waimea for its cool upslope weather, open spaces, fun outdoor activities, and beautiful vistas. This is truly God's Country! The 1920's paniolo style home (bungalow) was formerly part of the historic Waimea Hotel and was saved by the owners from the wrecking ball when it was moved to its present location and painstakingly restored to its former glory -- a project that took the owners over 2-years to complete. Each room is furnished with period antiques and fixtures including an old, double drain, porcelain kitchen sink, period porcelain pedestal sinks in the bathrooms, chandeliers and period lighting in every room, high ceilings with original crown moldings, as well as a wood burning fireplace with ample firewood, and a wrap-around porch to entice you out of the house for the evening. During your stay, you will feel as though you stepped back in time, to a time when life was easier, when relaxation was permissible, when sitting on the front porch was the evening's entertainment. On a clear, moonlit night, you will be treated to unsurpassed views of Mauna Kea. Feel free to do a 'moon walk' under the star-filled skies. Greet the morning with your cup of Kona coffee and watch the sunrise as you gaze across Parker Ranch's vast pastures and grazing cattle. Watch as the sun dances across two beautiful pu'u (cinder cones) fronting the property and the Jurassic Park-like scenery surrounding the bungalow-house. Pu'u Menehune is surrounded by beautiful, native forests, horse and cattle ranches, pastures, and unspoiled forests, and has its own flowing stream with numerous waterfalls and ponds. Look and you will be treated to the sight of pheasants, turkeys, quail, as well as native honey-creepers and birds of prey like the Hawaiian owl (pueo) and Hawaiian hawk (io). Enjoy the beauty of your own stream and the many pristine waterfalls which cascade along its course forming numerous ponds. The property is partially forested with native koa, ohia, sandalwood trees, hapu'u ferns, maile, and other native plants. Other trees include apple, peach, pear, plum, cherry, orange, tangerine, lemon, lime, and clementine trees. Our 13 acre ranch offers you privacy, peace and quiet, hiking, and a nature walk along our pristine stream just a two-minute walk from the house, breathtaking waterfalls, and unsurpassed vistas of Mauna Kea and of Parker Ranch and its vast pastures, as well as abundant and unspoiled nature -- an artist's and photographer's delight! Located at a 3,300 foot elevation, the property offers constantly changing weather patterns and it is not unusual to find yourself in a cloud or mountain mist. Although you will feel like you are in a world of your own, the charming town of Waimea is just 5 minutes away by car and offers all modern conveniences. The only thing we ask is that you join us in cherishing and protecting our historic home and this beautiful land -- truly God's Country! Our historic, plantation bungalow features 2 bedrooms, 2 baths, a day-bed, a gourmet kitchen having an antique porcelain double sink, modern stainless steel appliances including refrigerator, gas stove with an electric oven located on an island, microwave, kitchen fully furnished with dishes (some antique), glasses (including wine glasses), cutlery, pots, pans, baking pans, spices, and partly stocked pantry. Kona coffee and various teas are provided in the 'coffee bar'. Other features include high ceilings with original mouldings, antique lighting, wood burning fireplace, wrap around porch to enjoy those breathtaking views, vistas from every room, cable t.v., DVD player, CD stereo (music will never sound better), and a walk-in, slate shower with panoramic views! The two bedrooms have queen sized beds that sleep 4 adults. One bedroom has a princess cradle for an infant or toddler. The living room has a 'day-bed' for a fifth adult or two if you like it cozy. A stacked washer/dryer is also available. We promise you a memorable stay! Aloha! Gail and Peter are the owners and proprietors of Pu'u Menehune. We grew up in Hawaii and love the Big Island (especially Waimea!) and have a passion for historic homes and architecture, antiques, and native flora and fauna. We undertook this project (Pu'u Menehune) to save this beautiful, historic paniolo home, to furnish it with antiques and period fixtures, and to surround it with native (indigenous and endemic) trees and plants, and to protect the beautiful stream and waterfalls. We are in the process of reforesting the property with native trees and understory. Pu'u Mehehune is truly unique. We don't brag the largest house, the most modern, the most number of bedrooms or fireplaces. We are a 'Waimea' experience. If you wish to come, to stay, and to experience Waimea as it 'was', to enjoy a beautiful historic, home in a breathtaking environment where you have privacy (an electronic ranch gate), peace, and quiet, and a place where you can't put your camera away or stop your wonderment, then we may be the property for you. Pu'u Menehune is not just a vacation rental -- it is an experience! You may not want to leave Pu'u Menehune once you come. Perhaps you should leave yourselves a few extra days in case you can't bring yourselves to pack your bags. We have had children cry when they were told by their parents that it is time to leave. We have had artists leave us their artwork to share with us drawings of our beautiful vistas. We have had photographers send us copies of their beautiful photographs of our property and views. We have had guests send us short-stories of their wonderful adventures and experiences during their stay. We have had guests leave us Aloha (love) gifts to show their appreciation for letting us sharing Pu'u Menehune with them. Pu'u Menehune is a delicate treasure. A place that is unique in its history, in its setting, in its architecture, in its views, in its natural and abundant flora and fauna, and its 'out of this world' stream and waterfalls. Enjoy the pictures! They tell the story better than we can in words. 2 full baths (one bath has a walk in slate shower with panoramic views). Baths are outfitted with antique porcelain pedestal sinks. Farmland views, and views of "cinder cones". Puu Menehune has an ohia forest surrounding the waterfall and the home has ohia, cherry blossom and fruit trees around it. Unobstructed view of magnificent Mauna Kea -- the best view on the island! Fully furnished kitchen with dishes, cutlery, glasses, etc. Gourmet Kitchen fully outfitted with pots, pans, cutlery, dishes, etc. Kitchen has beautiful views and is located next to dining room that also has fabulous views! We really enjoyed our stay. The cottage is spacious, clean and comfortable. It was easy to stay here with a well equipped kitchen, pleasant living spaces and comfortable bedrooms. Thanks for having us! This was our 7th trip to the Big Island. We finally ventured out of the Kohala Coast resort areas and into Waimea. And we are so glad we did! The house is charming and there is a wonderful picture book explanation of how the house got there and all the love that the homeowners put into it. We woke to the sound of roosters crowing and enjoyed a nice cup of coffee while watching the sunrise over Mauna Kea. Our 18 month old loved to see the horses running in the pasture down the hill and would wave to them all day. We picked Meyer lemons and clementines from the trees for snacks. We enjoyed the glorious smell of gardenias from the bush outside. We made full use of the gas stove to cook great meals. We found hidden gems in Waimea like the Waimea Butcher (go see Mills and enjoy his awesome dedication to his craft). And their was high speed internet so we could occasionally connect for job duties if we had to. I could go on and on and we will be back. This is our second visit to this relaxing, lovely spot. There is so much to experience in this region of the Island, and this is the perfect convenient location for your explorations. The cottage is by far the most organized and stocked residence I have ever rented through VRBO. The views are gorgeous and the cottage is lovable and you will love it too! What a beautiful spot on earth! When the sun is shining you will think you are in heaven. While there we experienced heavy trade winds that knocked out power lines. The house really isn’t built to keep occupants warm during days when temps are low as 58. The house is up on a hill in the cloud line so be prepared for wind and rain as well as sun. Despite the changes in weather it’s a beautiful spot from which to view the stars on a clear night and enjoy the fireplace, which we did often, on chillier nights and mornings. Oh, and the antique furniture is not functional so be prepared to live out of your suitcase. The best place to stay on the Big Island! Oh my gosh! I do not know where to start! We (family of 4) love staying off the beaten path, and Peter and Gail have the perfect place! Great for relaxing after a day of being a typical tourist or hanging out at the local farmer's markets. This 100 year-old renovated home is furnished with beautiful antiques and has all the modern conveniences. Super cozy and comfortable. Extra blankets were welcome on the few nights where the trade winds were blowing. The wrap-around porch is great and the views of Mauna Kea are amazing! The sun streaming through the windows into the sunroom and on the south facing porch are perfect for morning coffee and to watch the clouds and mist drift through the Wiamea area below. There is no light pollution and the star gazing is only better at the Mauna Kea visitor center (just an hour drive away). Beaches are only 20 minutes away! Great boogie boarding at Hapuna and awesome snorkling at "69 beach" and Spencer Beach. - Hang Loose Boat Tours has a great snorkel trip where swimming with spinner dolphins is included along with great stories of the history of Hawaii. We stopped at Captain Cook Monument and snorkeled. The entire morning was incredible!! Captain Tim even told us about "Turtle Beach" which was just a 5 minute walk from the harbor. We saw about 10 turtles basking and swimming! - On Saturdays, there is a road side bar-b-que on the way (like 3 minutes away from the house) to Waimea. I think it is called Hui Hui. The combo plate is a must! Best EVER! - Mauna Kea Observatory Stargazing (Tue, Wed, Fri, & Sat) is incredible! The video about the observatories above is really interesting, but seeing nebula and other galaxies as well as planets in our own solar system is beyond words!!! My brother and sister-in-law live in Wiamea and will be recommending Pu'u Menehune to their friends. We stayed ten days, and my family is looking forward to visiting again, and staying at Pu'u Menehune! Definitely God's Country!! PU'U MENEHUNE IS HEAVEN ON EARTH! Pu'u Menehune is an amazing experience as a whole. The property itself is breathtaking and the home has all of your country comforts along with modern day essentials. You will leave Pu'u Menehune rejuvinated! A big MAHALO to Peter and Gail for sharing their special home with us. Pu'u Menehune (Hawaiian for cinder cone housing small legendary people) is located on a 13-acre, former Parker Ranch bull pasture with a flowing stream and numerous waterfalls! Pu'u Menehune has the BEST views of Mauna Kea ('White Mountain') in all of Waimea! Go hiking, exploring, swimming in waterfall-ponds, bird-watching, and walking through our botanical gardens of koa, ohia, iliahi (sandalwood), maile, protea bushes, and numerous fruiting trees without leaving the property! 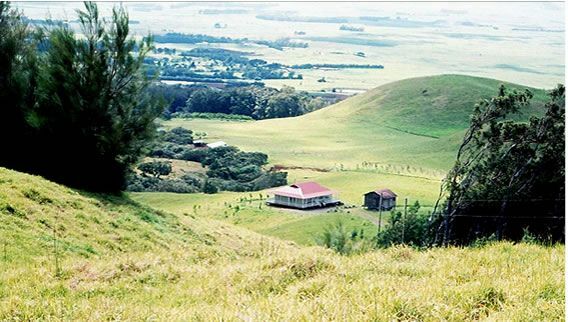 Although you will feel as though you are in a world by yourself, Waimea Town is just 5 minutes away by car. Waimea sits at the base of 14,000' Mauna Kea volcano which is the premier site in the Northern Hemisphere for astronomical observation. If you are adventurous, take a drive to the top of Mauna Kea and experience the heavens. Waimea is also home to one of Hawaii's oldest churches, the Imiola Congregational Church, built by the missionaries in the early 1700's. Waimea is full of history from ancient Hawaiian temples (heeiau) and settlements dating back a millinnium to WWII days when soldiers of the Second and Fifth Marine Divisions prepared for battle at Iwo Jima and Okinawa. Waimea has preserved many of its historic buildings and these designs have been followed in its newer buildings. It has many quaint shopping destinations which have boutique stores featuring local crafts and products as well as several antique shops. Waimea also has become a culinary center of the State and the Pacific and offers some of the finest restaurants in Hawaii including Merriman's, Waimea Ranch House, Red Water Cafe, Parker Ranch Broiler, and others. These progressive chefs are constantly developing new dishes using produce and meats from Waimea's organic farms and ranches and fish from nearby Kawaihae Harbor. If you enjoy cooking, pick up some local fresh produce from one of the many nearby farmer's markets and cook to your heart's delight in your gourmet kitchen. Your family and friends will love your tasty treats! If you are lucky, you may catch Waimea's fresh strawberries in season! They are the best! Activities in Waimea include the Cherry Blossom Festival held in early February, the Parker Ranch Rodeo held on July 4th, an old fashioned Christmas Parade, and the Parker Ranch Museum. Visit the historic homes of Samuel Parker, who, with a land-grant from King Kamehameha The Great, started what became, and still is, one of America's largest ranches at over 200,000 acres. At Pu'u Menehune, you will be part of that history! Pu'u Menehune, at an elevation of 3,300 feet, is only a 20 minute drive from some of the most beautiful beaches in the World including Hapuna Beach State Park and Kauna'oa Beach located at the Mauna Kea Beach Resort! Hapuna Beach, measuring half a mile, is the Bis Island's largest white sand beach. In one annual survey, it was rated by 'Dr. Beach' as the best beach in America. Kauna'oa is a beautiful, crescent-shaped beach of white sand leading into azure water framed by swaying palms. So beautiful is this beach, that it is annually voted on of the top beaches in the world by Conde Nast's 'Traveler' Magazine. Nearby is Puako Beach where you can snorkel and swim with the turtles, but please don't touch - it's against the law. If golfing is your pleasure, you are lucky! The Kohala Resorts, which include the Mauna Kea, the Hapuna Beach, the Mauna Lani (Senior Men's Skins Game), and the Waikoloa offer some of the best golfing in the world - and have some of the most beautiful ocean holes you will ever get a chance to play. Other adventures include horseback riding at Kahua Ranch, a short, but beautiful, drive away, or at Waipio Valley which leads to a beautiful waterfall where you can swim in the pond below the falls. The nearby plantation town of Hawi offers a fun and safe flume ride in a kayak along a historic irrigation canal carved into the mountainside, or just sit back and enjoy the car ride along the Kohala Mountain Road which is rated by many travel magazines as one of the ten best scenic drives in America. And, for your day trip, you must venture to Volcano National Park and see the lava! Yes, Madam Pele has been erupting for the past 15 years, and, if you are lucky, you may be able to see lava as it flows to the sea. And this is just the beginning! There is so much more that awaits you. Aloha! Rental fee due 60-days prior to stay. Security deposit of $500.00 is due with signed contract. Booking dates are not secured until both rental fee and security deposit are received. Please note that we do not allow renters to wear shoes in the house. If you need to wear shoes in the house, then this home is not for you.